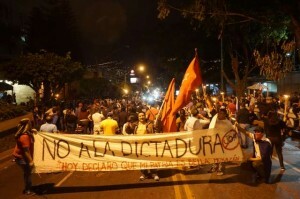 TEGUCIGALPA, HONDURAS – You may have seen the photographs of the violent protests here in the capital of Honduras when the right-wing candidate Juan Orlando Hernández installed himself as president two weeks ago after manipulating the November election in his favor. 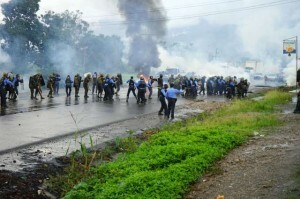 For hours, the opposition demonstrators appeared like dark forms in the grey haze of tear gas as they faced off against three types of police and soldier. 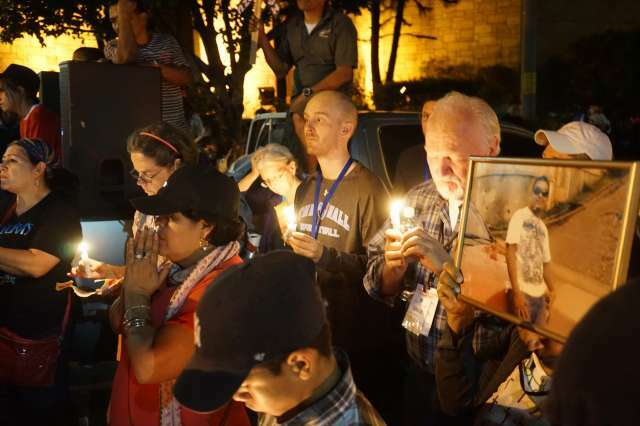 But you probably never saw a more important event the next night: an interfaith vigil and demonstration calling for national dialogue and a peaceful return to a constitutional government. 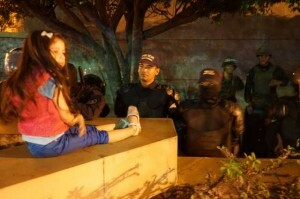 In spite of the confrontations of previous day, more than 500 Hondurans streamed onto the Avenida La Paz directly in front of the bunker of a U.S. Embassy and freely shouted in defiance to those in the building, with an appeal to the lines of police and soldiers guarding it and, perhaps equally important, to strengthen hope in each other. 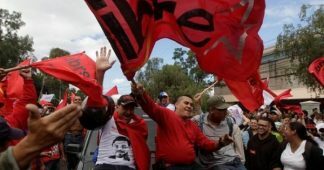 Hondurans march in non-violent demonstration at the U.S. Embassy, Sunday, Jan. 28, in opposition to installation of president Juan Orlando Hernández. 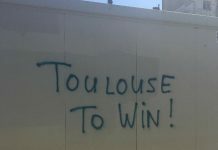 Photo courtesy of Mark Coplan. Speaker after speaker railed against the stolen presidential election, the crisis of militarization in Honduras, and the disaster of this slow social strangulation supported by the United States. In the street, Hondurans sang and danced and cried with grief for the wounded and dead at the hands of the military. For a moment, even surrounded by the machinery of repression, the gathering became a cathartic fiesta of freedom. 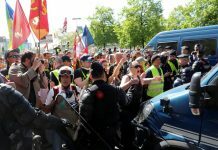 By all accounts, this moment of free speech and assembly was possible because of the presence of a delegation of some 50 interfaith and peace activists, largely from the United States. We stood between phalanx of police and army soldiers in front of the U.S. embassy and the crowds of Hondurans on the street. 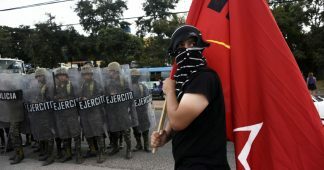 The police and military did not attack with tear gas and long wooden clubs called garrotes as they had attacked the demonstrations the day before. Apparently, the newly installed government, dependent on the U.S. government aid, decided it was unwise, or at least bad public relations, to attack the peaceful presence of U.S. citizens. 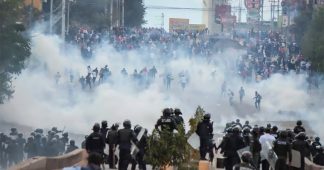 Most remarkable of all, we witnessed what is really possible in Honduras, the kind of dialogue, in embryo, that could heal this wounded, battered and traumatized country; a national dialogue that includes all segments of the society and searches for solutions to the endemic poverty, violence and social inequality so prevalent in Honduras. 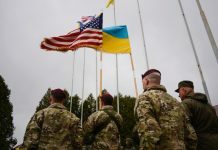 At times, the speakers appealed to the soldiers standing in the shadows between the shrubs on the sidewalks and the concrete facade of the embassy. 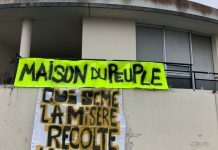 Occasionally, a few of the police responded to comments of the crowd with smiles and nods of heads of some of the demonstrators, and for a moment, it held the promise of reconciliation. For most of the vigil, however, they stood stiff and impersonal behind face shields and helmets glistening in the street lights. Underlying the joy and anger, there was ever-present grief. A white sheet was draped across the street with the names of those murdered and assassinated during the repression in protests since the November election. I’m standing next to the woman holding a photo of her son, killed during a demonstration. She was afraid to show her face for the photo. Photo by Mark Coplan. 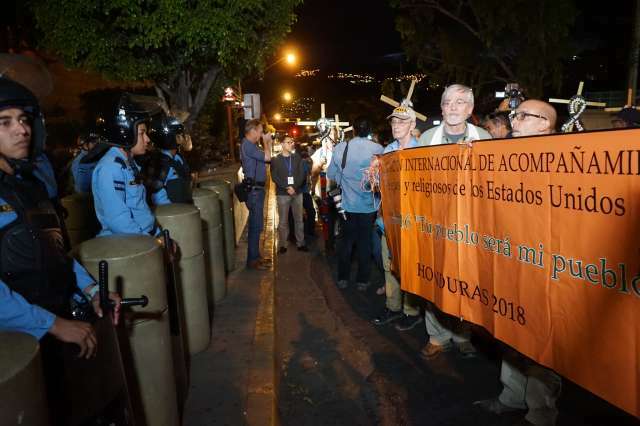 Our delegation was unusual in that we were responding to an emergency appeal put out by Father Ismael Moreno, known as Padre Melo, one of the best known progressive leaders in Honduras, for international support during the week of national protests before the installation of Hernández. Melo is a Jesuit priest and director of radio station Radio Progreso, Honduras’ version of Democracy Now!, and located in historically progressive region about 320 kilometers northwest of the capital. Since last December, Melo and the station staff has been receiving serious death threats. First, the station was knocked off the air for almost a week in the capital after the destruction of its transmitting antenna there during a night-time act of sabotage. Two weeks later, just before New Year’s Eve, posters appeared one morning on the walls of the town of El Progreso naming Melo and others “El eje del mal en la perla del Ulúa.” –The ‘axis of evil’ in the “Pearl” of the River Ulúa, using a previous name for the town based on the nearby river. Then an equally serious death threat came on Jan. 20, within a week of the inauguration and just before our arrival. 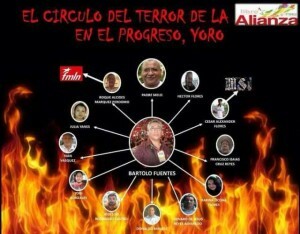 At night, pamphlets were thrown out of vehicles and left in public areas of the town claiming to identify El circulo del terror de la Alianza – “the circle of terror of the Alliance” in Progreso. It showed the faces of 12 leading members of the opposition Alianza arranged like a clock, with Melo’s face the largest and at the twelve o’clock position on top. This campaign of vilification evoked deeply painful memories from the decades of repression, death squads and assassinations in Honduras and throughout Central America. 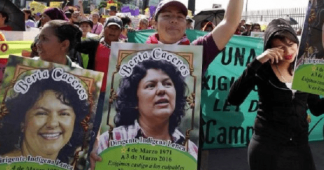 Last year, Berta Caceres, an internationally known environmental activist in Honduras, was murdered in her home at 1 a.m. by intruders suspected to be linked to an elite U.S.-trained military intelligence unit. This murder, in spite of security guards assigned to her by the government, sent shock waves through progressive community in Honduras and internationally. There are numerous reports of a military plot or links to U.S.-trained soldiers. 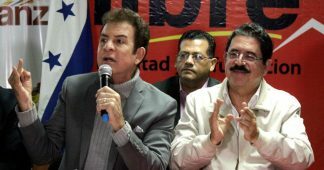 Recognizing the imminent danger for all in the opposition coalition, the Alianza, Melo issued his urgent appeal for international support. 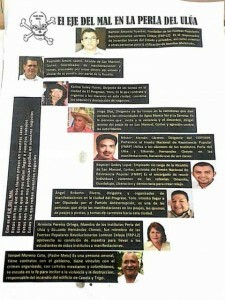 Though the last-minute organizing of two Berkeley-based nonprofits, SHARE and the Interfaith Movement for Human Integrity, a delegation was organized and the 50 faith and peace activists — five times larger than expected — arrived at the airport in San Pedro Sula on Wednesday, Jan. 24, four days after the last death threat. At first, we didn’t know what to expect as we arrived at the San Pedro airport and went through two check-points of questioning by customs officials. But we emerged into the main airport lobby to the cheers of a small crowd of supporters who opened their signs of protest and stretched out a black cloth bearing the faces of two dozen recent victims of the murder campaign targeting activists since the Nov. 26 “electoral coup,” as it’s been called. Melo, a small bear of a man, came forward, beaming, and shaking hands and hugging us. He is shorter than many of us norteamericanos, and his relief was visible. To hug me, he laid his head on my chest like a son, a gesture of humility and gratitude for our presence here. Certainly, a week of my time in the town of El Progreso is nothing compared to living under the threat of beatings or death, as Melo, the radio station and much of the population must live with day and night. Over 15 members of the station have received death threats, some repeatedly. 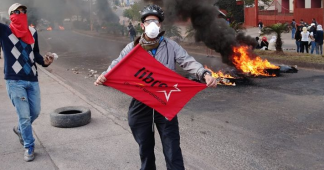 During a time of repression, death came come quickly, at night, as it did for Caceres and also, in 2014, for Carlos Mejia Orellana, the marketing manager for Radio Progresso. Or it came come slowly, as it did for some of the victims whose beaten faces stare out at us from the photographs at the airport. During our week, we stayed close to Melo, the staff at Radio Progreso and attended some of the opposition protests as witnesses. We accompanied human rights observers between the two sides in some of the many road blockades, called a toma, or a taking of the street. 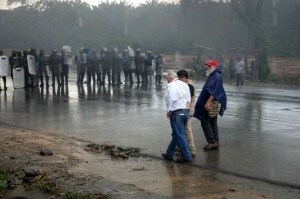 Sometimes, we witnessed negotiations and other times, we witnessed the charge of police against the demonstrators. Over the years, I have traveled to Central America for different reasons, but this was the first time that I was with a U.S.-based delegation directly intervening in a power conflict with whatever authority, or privilege, we could muster when the lives of the people who became our friends depend on the conflict’s resolution. 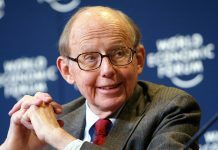 I returned home with a troubled conscience, knowing how little we could actually do in the face of the disastrous policies of our government toward these countries. As we all know, the United States has aided, defended and profited from the horrific civil wars in Central America for 40 years — bloodbaths that have stained the American conscience with shame and dishonor. The U.S. is now adding to this disgraceful legacy with its anti-immigration policies for those fleeing exactly those countries where U.S. policies have weighed heaviest. ”Hundreds of thousands of deaths took place throughout these countries. Did they take place? And are they in all cases attributable to US foreign policy? The answer is yes they did take place and they are attributable to American foreign policy. But you wouldn’t know it. Our delegation intends to provide eyes and ears to witness and remember. To Padre Melo and the journalists at Radio Progreso, our brief presence tells them: “No están solos.” You are not alone. David A. Sylvester is a Bay Area writer, teacher and contributor to Tikkun. A Roman Catholic, he is also a member of Beyt Tikkun and has traveled to El Salvador as an election observer in 2009 and to Iraq in 1998 on a humanitarian mission with Voices in the Wilderness. 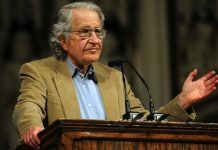 In 2006, he served three months in a federal prison camp for civil disobedience at the U.S. army base at Fort Benning to protest the U.S.-training of Central American military troops.